Scroll down to print a free Multiplication Worksheet. Practice your math skills by solving these 20 multiplication problems. A free printable answer key is also provided. To print any image on this page, just right-click on the image, and select either a PRINT option or a SAVE option from your drop down menu. The SAVE option will send the image to your picture file for future use. From there you can reduce or enlarge it as needed, and adjust the margins for optimal printed results. You can even custom design your image to suit your personal needs. The worksheet shown below features triple-digit numbers multiplied by single-digit numbers. Multiplication is one of the four basic operations in elementary arithmetic. The other three are addition, subtraction and division. Multiplication is the opposite of division. When dealing with whole numbers, multiplication is simply repeated addition. Multiplication in math is represented by a small letter x. The numbers being multiplied are called factors. The result of the multiplication is called the product. For a harder multiplication worksheet, more math problems, and other free printable items, visit any of the links shown on this page. Another way to multiply single digit numbers by three digit numbers is by breaking the problem up into three separate equations. For instance, if the problem is 8 x 624, the solution is 8 x 600, PLUS 8 x 20, PLUS 8 x 4. 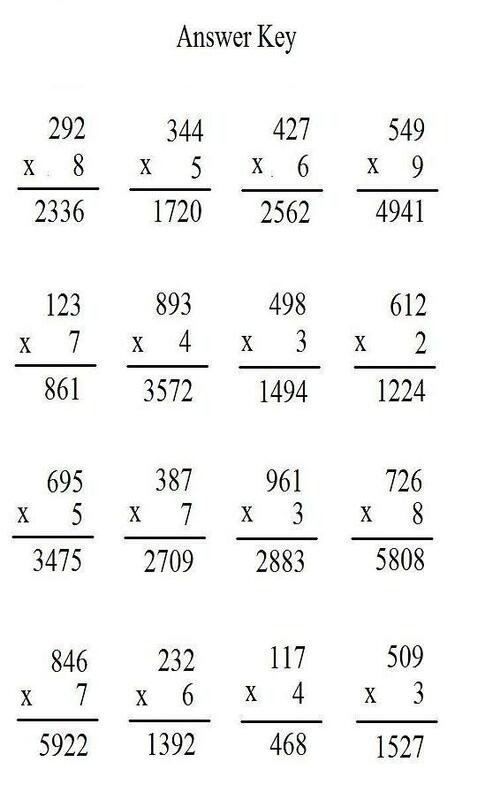 In other words, the solution is 4,800 + 160 + 32, which is 4,992. A man in Saint Paul Minnesota once solved 100 multiplication problems in just over a minute. In rare cases, some people who are afflicted with autism and also mentally retarded can do multiplication in their heads as well as the world's best mathematicians. The world record time for solving ten problems that involve multiplying two 8-digit numbers together is just under four and a half minutes. The feat was accomplished by Marc Jornet Sanz of Spain, who beat his own previous record of 4 minutes, 56 seconds. It is not too surprising is that Mr. Sanz also holds the world speed record for multiplying 5-digit numbers. 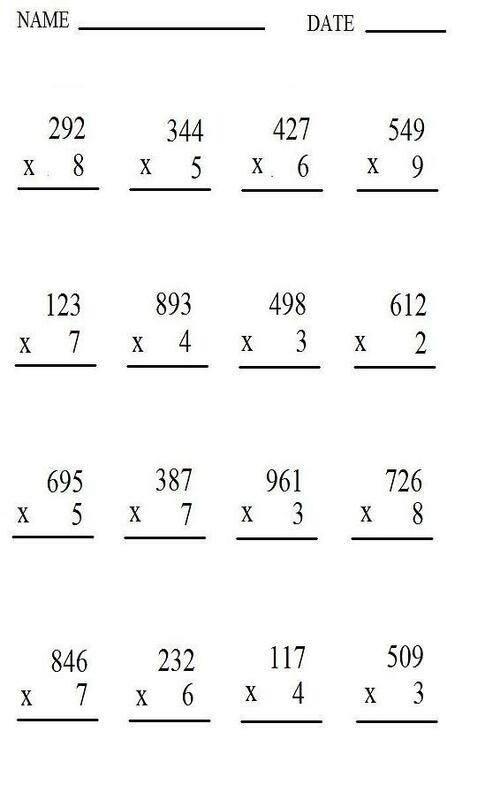 Shown below is the Answer Key for the Multiplication Worksheet shown above. To view a wide assortment of free printable games, work sheets, charts, tables, lists, jokes, tattoo designs, clip art designs, reusable calendars and other cool items, visit any of the links shown on this page. Visit this link for Printable Fraction Worksheets. Go here for an Assortment of Free Printable Worksheets. See this page for a list of Universities and PhD programs in All 50 States and Washington DC. Go here to learn how to Work From Home Anywhere in America.